Philips ZOOM! Whitening is a 1 hour fast and effective procedure carried out in the dental chair by dentists. Philips Zoom is not only clinically proven to whiten teeth up to eight shades, it’s also completely safe and does not harm or thins enamel. 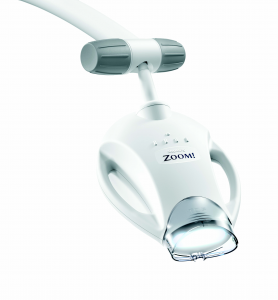 Philips Zoom with Relief ACP has been shown to reduce sensitivity often experienced with in chair teeth whitening as well. During the procedure, your gums are carefully protected with a special covering before application of the hydrogen peroxide whitening gel. Hydrogen peroxide breaks down the carbon bonds making up stains on and in your teeth. The intense light of the Philips Zoom WhiteSpeed Whitening LED Accelerator shining on the whitening gel makes the process work even faster, improving whitening results by as much as 40%. Most whitening services are designed to last for a long period of time, but relapse is not uncommon due to personal behaviors that restain your teeth like regular intake of coffee, wine etc. The dentist will give you instructions for care before and after your treatment. The best option to maintain the brightness of your smile after ZOOM! In chair whitening is the take home option where individually customised trays are made for you and a 2 week home application bleaching material is provided. The cost is $280 for the trays and the bleach.